The consultants at Union Hill Associates have been on the forefront of three-year degree research, consulting, and curriculum implementation since 1995, when Southern New Hampshire University (SNHU) was awarded a FIPSE Grant from the Department of Education to develop a three-year undergraduate degree program. The goal was to create an environment in which a traditional 4-year business curriculum could be delivered in 3 uncompressed years, essentially cutting the cost of college tuition by 25% without sacrificing learning outcomes. Two years later, SNHU launched its 3Year Honors program, the first integrated 3-year degree in the country. While at SNHU, members of Union Hill Associates helped develop the country's first integrated 3-year bachelor's program in 1997. By 2010, fewer than 30 colleges offered 3-year degree programs; and all but one were accelerated or prior-learning formats. But thanks to rising education costs and legislation in states like Ohio, we're seeing the short list of schools that offer 3-year degree programs continue to grow. 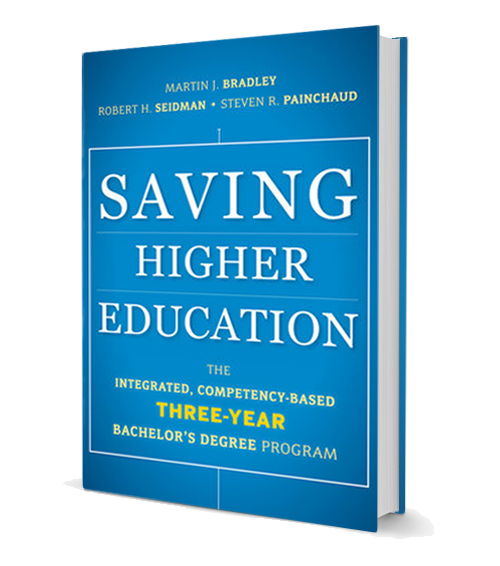 Saving Higher Education was written by members of Union Hill Associates and recently released by Jossey-Bass™. It's based on their work developing SNHU's integrated 3-year bachelor's degree program, the longest running in the country. 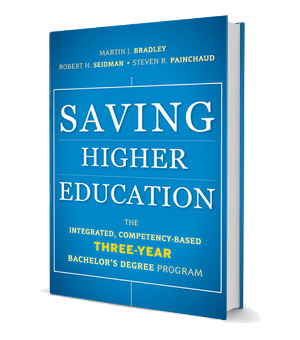 The book provides administrators with a blueprint for creating, sustaining, and growing such a program at higher education institutions of all types and sizes. What is the Integrated, Competency-Based 3-year Degree Model? The integrated, competency-based model has a predetermined set of competencies that are foundational to the students' educational experience. In addition to the set of competencies, the curriculum is redesigned and integrated wherever possible to maximize student learning opportunities throughout their entire educational experience. Teaching faculty that participate in the program receive an orientation outlining the curriculum design and are mindful of the program competencies, as well as accreditation standards and expectations. Utilizing a collaborative approach, faculty members deliver courses over a period of six semesters (120 credits) with no summer sessions or winter inter-sessions needed. The content is configured in a way that makes collaboration by faculty across disciplines more easily achieved. The competencies serve as guideposts for the content of all the academic experiences within the curriculum. Because the development of competencies occurs at varying levels of intensity throughout the three years, a key strategy employed is the use of master planning documents for each academic experience. 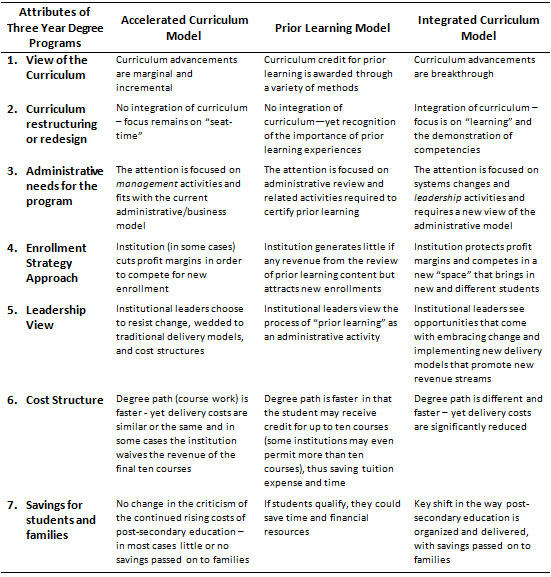 For each of the educational experiences, a written academic plan detailing the over-arching strategy for addressing the competencies included within the experience is developed, along with specific implementing activities that the faculty can employ. These academic plans are regularly reviewed and updated as part of an ongoing assessment of the program. The academic plans serve as the basis for the development of model syllabi which demonstrate the relationship between the academic requirements, assignments, and the competencies.